A single-tasking system can only run one program at a time, while a multi-tasking operating system allows more than one program to be running in concurrency. This is achieved by time-sharing, where the available processor time is divided between multiple processes. These processes are each interrupted repeatedly in time slices by a task-scheduling subsystem of the operating system. Multi-tasking may be characterized in preemptive and co-operative types. In preemptive multitasking, the operating system slices the CPU time and dedicates a slot to each of the programs. Unix-like operating systems, such as Solaris and Linux—as well as non-Unix-like, such as AmigaOS—support preemptive multitasking. Cooperative multitasking is achieved by relying on each process to provide time to the other processes in a defined manner. 16-bit versions of Microsoft Windows used cooperative multi-tasking. 32-bit versions of both Windows NT and Win9x, used preemptive multi-tasking. Single-user operating systems have no facilities to distinguish users, but may allow multiple programs to run in tandem. A multi-user operating system extends the basic concept of multi-tasking with facilities that identify processes and resources, such as disk space, belonging to multiple users, and the system permits multiple users to interact with the system at the same time. Time-sharing operating systems schedule tasks for efficient use of the system and may also include accounting software for cost allocation of processor time, mass storage, printing, and other resources to multiple users. A distributed operating system manages a group of distinct computers and makes them appear to be a single computer. The development of networked computers that could be linked and communicate with each other gave rise to distributed computing. Distributed computations are carried out on more than one machine. When computers in a group work in cooperation, they form a distributed system. In an OS, distributed and cloud computing context, templating refers to creating a single virtual machine image as a guest operating system, then saving it as a tool for multiple running virtual machines. The technique is used both in virtualization and cloud computing management, and is common in large server warehouses. A real-time operating system is an operating system that guarantees to process events or data by a specific moment in time. A real-time operating system may be single- or multi-tasking, but when multitasking, it uses specialized scheduling algorithms so that a deterministic nature of behavior is achieved. An event-driven system switches between tasks based on their priorities or external events while time-sharing operating systems switch tasks based on clock interrupts. A library operating system is one in which the services that a typical operating system provides, such as networking, are provided in the form of libraries and composed with the application and configuration code to construct a unikernel: a specialized, single address space, machine image that can be deployed to cloud or embedded environments. OS/360 was used on most IBM mainframe computers beginning in 1966, including computers used by the Apollo program. In the early 1950s, a computer could execute only one program at a time. Each user had sole use of the computer for a limited period of time and would arrive at a scheduled time with program and data on punched paper cards or punched tape. The program would be loaded into the machine, and the machine would be set to work until the program completed or crashed. Programs could generally be debugged via a front panel using toggle switches and panel lights. It is said that Alan Turing was a master of this on the early Manchester Mark 1 machine, and he was already deriving the primitive conception of an operating system from the principles of the universal Turing machine. Later machines came with libraries of programs, which would be linked to a user's program to assist in operations such as input and output and generating computer code from human-readable symbolic code. This was the genesis of the modern-day operating system. However, machines still ran a single job at a time. At Cambridge University in England the job queue was at one time a washing line (clothes line) from which tapes were hung with different colored clothes-pegs to indicate job-priority. An improvement was the Atlas Supervisor introduced with the Manchester Atlas commissioned in 1962, "considered by many to be the first recognisable modern operating system". Brinch Hansen described it as "the most significant breakthrough in the history of operating systems." Through the 1950s, many major features were pioneered in the field of operating systems on mainframe computers, including batch processing, input/output interrupt, buffering, multitasking, spooling, runtime libraries, link-loading, and programs for sorting records in files. These features were included or not included in application software at the option of application programmers, rather than in a separate operating system used by all applications. In 1959, the SHARE Operating System was released as an integrated utility for the IBM 704, and later in the 709 and 7090 mainframes, although it was quickly supplanted by IBSYS/IBJOB on the 709, 7090 and 7094. In 1961, Burroughs Corporation introduced the B5000 with the MCP, (Master Control Program) operating system. The B5000 was a stack machine designed to exclusively support high-level languages with no machine language or assembler, and indeed the MCP was the first OS to be written exclusively in a high-level language – ESPOL, a dialect of ALGOL. MCP also introduced many other ground-breaking innovations, such as being the first commercial implementation of virtual memory. During development of the AS/400, IBM made an approach to Burroughs to license MCP to run on the AS/400 hardware. This proposal was declined by Burroughs management to protect its existing hardware production. MCP is still in use today in the Unisys ClearPath/MCP line of computers. Digital Equipment Corporation developed many operating systems for its various computer lines, including TOPS-10 and TOPS-20 time sharing systems for the 36-bit PDP-10 class systems. Before the widespread use of UNIX, TOPS-10 was a particularly popular system in universities, and in the early ARPANET community. RT-11 was a single-user real-time OS for the PDP-11 class minicomputer, and RSX-11 was the corresponding multi-user OS. 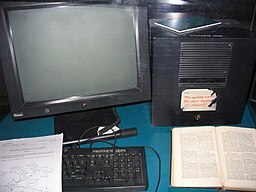 The first microcomputers did not have the capacity or need for the elaborate operating systems that had been developed for mainframes and minis; minimalistic operating systems were developed, often loaded from ROM and known as monitors. One notable early disk operating system was CP/M, which was supported on many early microcomputers and was closely imitated by Microsoft's MS-DOS, which became widely popular as the operating system chosen for the IBM PC (IBM's version of it was called IBM DOS or PC DOS). In the 1980s, Apple Computer Inc. (now Apple Inc.) abandoned its popular Apple II series of microcomputers to introduce the Apple Macintosh computer with an innovative graphical user interface (GUI) to the Mac OS. The introduction of the Intel 80386 CPU chip in October 1985, with 32-bit architecture and paging capabilities, provided personal computers with the ability to run multitasking operating systems like those of earlier minicomputers and mainframes. Microsoft responded to this progress by hiring Dave Cutler, who had developed the VMS operating system for Digital Equipment Corporation. He would lead the development of the Windows NT operating system, which continues to serve as the basis for Microsoft's operating systems line. Steve Jobs, a co-founder of Apple Inc., started NeXT Computer Inc., which developed the NEXTSTEP operating system. NEXTSTEP would later be acquired by Apple Inc. and used, along with code from FreeBSD as the core of Mac OS X (macOS after latest name change). Four operating systems are certified by The Open Group (holder of the Unix trademark) as Unix. HP's HP-UX and IBM's AIX are both descendants of the original System V Unix and are designed to run only on their respective vendor's hardware. In contrast, Sun Microsystems's Solaris can run on multiple types of hardware, including x86 and Sparc servers, and PCs. 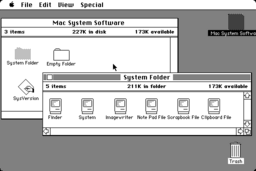 Apple's macOS, a replacement for Apple's earlier (non-Unix) Mac OS, is a hybrid kernel-based BSD variant derived from NeXTSTEP, Mach, and FreeBSD. The first server for the World Wide Web ran on NeXTSTEP, based on BSD. In 1974, University of California, Berkeley installed its first Unix system. Over time, students and staff in the computer science department there began adding new programs to make things easier, such as text editors. When Berkeley received new VAX computers in 1978 with Unix installed, the school's undergraduates modified Unix even more in order to take advantage of the computer's hardware possibilities. The Defense Advanced Research Projects Agency of the US Department of Defense took interest, and decided to fund the project. Many schools, corporations, and government organizations took notice and started to use Berkeley's version of Unix instead of the official one distributed by AT&T. Steve Jobs, upon leaving Apple Inc. in 1985, formed NeXT Inc., a company that manufactured high-end computers running on a variation of BSD called NeXTSTEP. One of these computers was used by Tim Berners-Lee as the first webserver to create the World Wide Web. Developers like Keith Bostic encouraged the project to replace any non-free code that originated with Bell Labs. Once this was done, however, AT&T sued. After two years of legal disputes, the BSD project spawned a number of free derivatives, such as NetBSD and FreeBSD (both in 1993), and OpenBSD (from NetBSD in 1995). macOS (formerly "Mac OS X" and later "OS X") is a line of open core graphical operating systems developed, marketed, and sold by Apple Inc., the latest of which is pre-loaded on all currently shipping Macintosh computers. macOS is the successor to the original classic Mac OS, which had been Apple's primary operating system since 1984. Unlike its predecessor, macOS is a UNIX operating system built on technology that had been developed at NeXT through the second half of the 1980s and up until Apple purchased the company in early 1997. The operating system was first released in 1999 as Mac OS X Server 1.0, followed in March 2001 by a client version (Mac OS X v10.0 "Cheetah"). Since then, six more distinct "client" and "server" editions of macOS have been released, until the two were merged in OS X 10.7 "Lion". Prior to its merging with macOS, the server edition – macOS Server – was architecturally identical to its desktop counterpart and usually ran on Apple's line of Macintosh server hardware. macOS Server included work group management and administration software tools that provide simplified access to key network services, including a mail transfer agent, a Samba server, an LDAP server, a domain name server, and others. With Mac OS X v10.7 Lion, all server aspects of Mac OS X Server have been integrated into the client version and the product re-branded as "OS X" (dropping "Mac" from the name). The server tools are now offered as an application. The Linux kernel originated in 1991, as a project of Linus Torvalds, while a university student in Finland. He posted information about his project on a newsgroup for computer students and programmers, and received support and assistance from volunteers who succeeded in creating a complete and functional kernel. Linux is Unix-like, but was developed without any Unix code, unlike BSD and its variants. Because of its open license model, the Linux kernel code is available for study and modification, which resulted in its use on a wide range of computing machinery from supercomputers to smart-watches. Although estimates suggest that Linux is used on only 1.82% of all "desktop" (or laptop) PCs, it has been widely adopted for use in servers and embedded systems such as cell phones. Linux has superseded Unix on many platforms and is used on most supercomputers including the top 385. Many of the same computers are also on Green500 (but in different order), and Linux runs on the top 10. Linux is also commonly used on other small energy-efficient computers, such as smartphones and smartwatches. The Linux kernel is used in some popular distributions, such as Red Hat, Debian, Ubuntu, Linux Mint and Google's Android, Chrome OS, and Chromium OS. Microsoft Windows is a family of proprietary operating systems designed by Microsoft Corporation and primarily targeted to Intel architecture based computers, with an estimated 88.9 percent total usage share on Web connected computers. The latest version is Windows 10. In 2011, Windows 7 overtook Windows XP as most common version in use. Microsoft Windows was first released in 1985, as an operating environment running on top of MS-DOS, which was the standard operating system shipped on most Intel architecture personal computers at the time. In 1995, Windows 95 was released which only used MS-DOS as a bootstrap. For backwards compatibility, Win9x could run real-mode MS-DOS and 16-bit Windows 3.x drivers. Windows ME, released in 2000, was the last version in the Win9x family. Later versions have all been based on the Windows NT kernel. Current client versions of Windows run on IA-32, x86-64 and 32-bit ARM microprocessors. In addition Itanium is still supported in older server version Windows Server 2008 R2. In the past, Windows NT supported additional architectures. Server editions of Windows are widely used. In recent years, Microsoft has expended significant capital in an effort to promote the use of Windows as a server operating system. However, Windows' usage on servers is not as widespread as on personal computers as Windows competes against Linux and BSD for server market share. ReactOS is a Windows-alternative operating system, which is being developed on the principles of Windows – without using any of Microsoft's code. There have been many operating systems that were significant in their day but are no longer so, such as AmigaOS; OS/2 from IBM and Microsoft; classic Mac OS, the non-Unix precursor to Apple's macOS; BeOS; XTS-300; RISC OS; MorphOS; Haiku; BareMetal and FreeMint. Some are still used in niche markets and continue to be developed as minority platforms for enthusiast communities and specialist applications. OpenVMS, formerly from DEC, is still under active development by Hewlett-Packard. Yet other operating systems are used almost exclusively in academia, for operating systems education or to do research on operating system concepts. A typical example of a system that fulfills both roles is MINIX, while for example Singularity is used purely for research. Another example is the Oberon System designed at ETH Zürich by Niklaus Wirth, Jürg Gutknecht and a group of students at the former Computer Systems Institute in the 1980s. It was used mainly for research, teaching, and daily work in Wirth's group. With the aid of the firmware and device drivers, the kernel provides the most basic level of control over all of the computer's hardware devices. It manages memory access for programs in the RAM, it determines which programs get access to which hardware resources, it sets up or resets the CPU's operating states for optimal operation at all times, and it organizes the data for long-term non-volatile storage with file systems on such media as disks, tapes, flash memory, etc. Interrupts are central to operating systems, as they provide an efficient way for the operating system to interact with and react to its environment. The alternative – having the operating system "watch" the various sources of input for events (polling) that require action – can be found in older systems with very small stacks (50 or 60 bytes) but is unusual in modern systems with large stacks. Interrupt-based programming is directly supported by most modern CPUs. Interrupts provide a computer with a way of automatically saving local register contexts, and running specific code in response to events. Even very basic computers support hardware interrupts, and allow the programmer to specify code which may be run when that event takes place. When an interrupt is received, the computer's hardware automatically suspends whatever program is currently running, saves its status, and runs computer code previously associated with the interrupt; this is analogous to placing a bookmark in a book in response to a phone call. 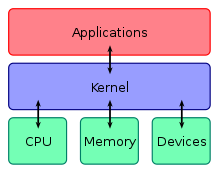 In modern operating systems, interrupts are handled by the operating system's kernel. Interrupts may come from either the computer's hardware or the running program. When a hardware device triggers an interrupt, the operating system's kernel decides how to deal with this event, generally by running some processing code. The amount of code being run depends on the priority of the interrupt (for example: a person usually responds to a smoke detector alarm before answering the phone). The processing of hardware interrupts is a task that is usually delegated to software called a device driver, which may be part of the operating system's kernel, part of another program, or both. Device drivers may then relay information to a running program by various means. A program may also trigger an interrupt to the operating system. If a program wishes to access hardware, for example, it may interrupt the operating system's kernel, which causes control to be passed back to the kernel. The kernel then processes the request. If a program wishes additional resources (or wishes to shed resources) such as memory, it triggers an interrupt to get the kernel's attention. Privilege rings for the x86 microprocessor architecture available in protected mode. 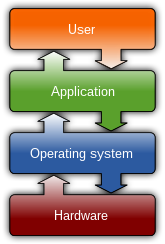 Operating systems determine which processes run in each mode. Modern microprocessors (CPU or MPU) support multiple modes of operation. CPUs with this capability offer at least two modes: user mode and supervisor mode. In general terms, supervisor mode operation allows unrestricted access to all machine resources, including all MPU instructions. User mode operation sets limits on instruction use and typically disallows direct access to machine resources. CPUs might have other modes similar to user mode as well, such as the virtual modes in order to emulate older processor types, such as 16-bit processors on a 32-bit one, or 32-bit processors on a 64-bit one. At power-on or reset, the system begins in supervisor mode. Once an operating system kernel has been loaded and started, the boundary between user mode and supervisor mode (also known as kernel mode) can be established. Supervisor mode is used by the kernel for low level tasks that need unrestricted access to hardware, such as controlling how memory is accessed, and communicating with devices such as disk drives and video display devices. User mode, in contrast, is used for almost everything else. Application programs, such as word processors and database managers, operate within user mode, and can only access machine resources by turning control over to the kernel, a process which causes a switch to supervisor mode. Typically, the transfer of control to the kernel is achieved by executing a software interrupt instruction, such as the Motorola 68000 TRAP instruction. The software interrupt causes the microprocessor to switch from user mode to supervisor mode and begin executing code that allows the kernel to take control. In user mode, programs usually have access to a restricted set of microprocessor instructions, and generally cannot execute any instructions that could potentially cause disruption to the system's operation. In supervisor mode, instruction execution restrictions are typically removed, allowing the kernel unrestricted access to all machine resources. The term "user mode resource" generally refers to one or more CPU registers, which contain information that the running program isn't allowed to alter. Attempts to alter these resources generally causes a switch to supervisor mode, where the operating system can deal with the illegal operation the program was attempting, for example, by forcibly terminating ("killing") the program). In both segmentation and paging, certain protected mode registers specify to the CPU what memory address it should allow a running program to access. Attempts to access other addresses trigger an interrupt which cause the CPU to re-enter supervisor mode, placing the kernel in charge. This is called a segmentation violation or Seg-V for short, and since it is both difficult to assign a meaningful result to such an operation, and because it is usually a sign of a misbehaving program, the kernel generally resorts to terminating the offending program, and reports the error. If a program tries to access memory that isn't in its current range of accessible memory, but nonetheless has been allocated to it, the kernel is interrupted in the same way as it would if the program were to exceed its allocated memory. (See section on memory management.) Under UNIX this kind of interrupt is referred to as a page fault. When the kernel detects a page fault it generally adjusts the virtual memory range of the program which triggered it, granting it access to the memory requested. This gives the kernel discretionary power over where a particular application's memory is stored, or even whether or not it has actually been allocated yet. 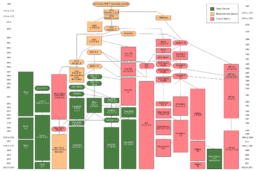 An operating system kernel contains a scheduling program which determines how much time each process spends executing, and in which order execution control should be passed to programs. Control is passed to a process by the kernel, which allows the program access to the CPU and memory. Later, control is returned to the kernel through some mechanism, so that another program may be allowed to use the CPU. This so-called passing of control between the kernel and applications is called a context switch. On many single user operating systems cooperative multitasking is perfectly adequate, as home computers generally run a small number of well tested programs. The AmigaOS is an exception, having preemptive multitasking from its very first version. Windows NT was the first version of Microsoft Windows which enforced preemptive multitasking, but it didn't reach the home user market until Windows XP (since Windows NT was targeted at professionals). File systems allow users and programs to organize and sort files on a computer, often through the use of directories (or "folders"). Access to data stored on disks is a central feature of all operating systems. Computers store data on disks using files, which are structured in specific ways in order to allow for faster access, higher reliability, and to make better use of the drive's available space. The specific way in which files are stored on a disk is called a file system, and enables files to have names and attributes. It also allows them to be stored in a hierarchy of directories or folders arranged in a directory tree. Various differences between file systems make supporting all file systems difficult. Allowed characters in file names, case sensitivity, and the presence of various kinds of file attributes makes the implementation of a single interface for every file system a daunting task. Operating systems tend to recommend using (and so support natively) file systems specifically designed for them; for example, NTFS in Windows and ext3 and ReiserFS in Linux. However, in practice, third party drivers are usually available to give support for the most widely used file systems in most general-purpose operating systems (for example, NTFS is available in Linux through NTFS-3g, and ext2/3 and ReiserFS are available in Windows through third-party software). The key design goal of device drivers is abstraction. Every model of hardware (even within the same class of device) is different. Newer models also are released by manufacturers that provide more reliable or better performance and these newer models are often controlled differently. Computers and their operating systems cannot be expected to know how to control every device, both now and in the future. To solve this problem, operating systems essentially dictate how every type of device should be controlled. The function of the device driver is then to translate these operating system mandated function calls into device specific calls. In theory a new device, which is controlled in a new manner, should function correctly if a suitable driver is available. This new driver ensures that the device appears to operate as usual from the operating system's point of view. Client/server networking allows a program on a computer, called a client, to connect via a network to another computer, called a server. Servers offer (or host) various services to other network computers and users. These services are usually provided through ports or numbered access points beyond the server's IP address. Each port number is usually associated with a maximum of one running program, which is responsible for handling requests to that port. A daemon, being a user program, can in turn access the local hardware resources of that computer by passing requests to the operating system kernel. In addition to the allow or disallow model of security, a system with a high level of security also offers auditing options. These would allow tracking of requests for access to resources (such as, "who has been reading this file?"). Internal security, or security from an already running program is only possible if all possibly harmful requests must be carried out through interrupts to the operating system kernel. If programs can directly access hardware and resources, they cannot be secured. A screenshot of the Bash command line. Each command is typed out after the 'prompt', and then its output appears below, working its way down the screen. The current command prompt is at the bottom. A screenshot of the KDE Plasma 5 graphical user interface. Programs take the form of images on the screen, and the files, folders (directories), and applications take the form of icons and symbols. A mouse is used to navigate the computer. Most of the modern computer systems support graphical user interfaces (GUI), and often include them. In some computer systems, such as the original implementation of the classic Mac OS, the GUI is integrated into the kernel. While technically a graphical user interface is not an operating system service, incorporating support for one into the operating system kernel can allow the GUI to be more responsive by reducing the number of context switches required for the GUI to perform its output functions. Other operating systems are modular, separating the graphics subsystem from the kernel and the Operating System. In the 1980s UNIX, VMS and many others had operating systems that were built this way. Linux and macOS are also built this way. Modern releases of Microsoft Windows such as Windows Vista implement a graphics subsystem that is mostly in user-space; however the graphics drawing routines of versions between Windows NT 4.0 and Windows Server 2003 exist mostly in kernel space. Windows 9x had very little distinction between the interface and the kernel. Many computer operating systems allow the user to install or create any user interface they desire. 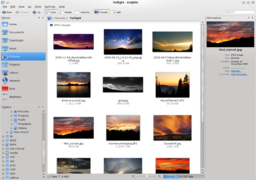 The X Window System in conjunction with GNOME or KDE Plasma 5 is a commonly found setup on most Unix and Unix-like (BSD, Linux, Solaris) systems. A number of Windows shell replacements have been released for Microsoft Windows, which offer alternatives to the included Windows shell, but the shell itself cannot be separated from Windows. Operating system development is one of the most complicated activities in which a computing hobbyist may engage. A hobby operating system may be classified as one whose code has not been directly derived from an existing operating system, and has few users and active developers. Examples of a hobby operating system include Syllable and TempleOS. Unix was the first operating system not written in assembly language, making it very portable to systems different from its native PDP-11. This cost in supporting operating systems diversity can be avoided by instead writing applications against software platforms such as Java or Qt. These abstractions have already borne the cost of adaptation to specific operating systems and their system libraries. ^ "Desktop Operating System Market Share Worldwide | StatCounter Global Stats". StatCounter Global Stats. Retrieved 18 December 2017. ^ "Mobile & Tablet Operating System Market Share Worldwide | StatCounter Global Stats". StatCounter Global Stats. Retrieved 18 December 2017. ^ "Strategy Analytics: Android Captures Record 88 Percent Share of Global Smartphone Shipments in Q3 2016". 2 November 2016. Archived from the original on 5 November 2016. ^ Lorch, Jacob R., and Alan Jay Smith. "Reducing processor power consumption by improving processor time management in a single-user operating system." Proceedings of the 2nd annual international conference on Mobile computing and networking. ACM, 1996. ^ Mishra, B.; Singh, N.; Singh, R. (2014). "Master-slave group based model for co-ordinator selection, an improvement of bully algorithm". International Conference on Parallel, Distributed and Grid Computing (PDGC). pp. 457–460. doi:10.1109/PDGC.2014.7030789. ISBN 978-1-4799-7682-9. ^ Gagne, Silberschatz Galvin (2012). Operating Systems Concepts. New York: Wiley. p. 716. ISBN 978-1118063330. ^ a b Hansen, Per Brinch, ed. (2001). Classic Operating Systems. Springer. pp. 4–7. ISBN 0-387-95113-X. ^ Lavington, Simon (1998). A History of Manchester Computers (2nd ed.). Swindon: The British Computer Society. pp. 50–52. ISBN 978-1-902505-01-5. ^ Brinch Hansen, Per (2000). Classic Operating Systems: From Batch Processing to Distributed Systems. Springer-Verlag. ^ "Intel® Microprocessor Quick Reference Guide - Year". www.intel.com. Archived from the original on 25 April 2016. Retrieved 24 April 2016. ^ Ritchie, Dennis. "Unix Manual, first edition". Lucent Technologies. Archived from the original on 18 May 2008. Retrieved 22 November 2012. ^ "OS X Mountain Lion – Move your Mac even further ahead". Apple. Archived from the original on 23 May 2011. Retrieved 7 August 2012. ^ a b "Top 5 Operating Systems from January to April 2011". StatCounter. October 2009. Archived from the original on 26 May 2012. Retrieved 5 November 2009. ^ "IDC report into Server market share". Idc.com. Archived from the original on 27 September 2012. Retrieved 7 August 2012. ^ LinuxDevices Staff (23 April 2008). "Linux still top embedded OS". LinuxGizmos.com. Archived from the original on 19 April 2016. Retrieved 5 April 2016. ^ "Sublist Generator". Top500.org. Retrieved 6 February 2017. ^ "Global Web Stats". Net Market Share, Net Applications. May 2011. Archived from the original on 25 January 2010. Retrieved 7 May 2011. ^ "Global Web Stats". W3Counter, Awio Web Services. September 2009. Archived from the original on 28 June 2012. Retrieved 24 October 2009. ^ "Operating System Market Share". Net Applications. October 2009. Archived from the original on 25 January 2010. Retrieved 5 November 2009. ^ "w3schools.com OS Platform Statistics". Archived from the original on 21 August 2011. Retrieved 30 October 2011. ^ "Stats Count Global Stats Top Five Operating Systems". Archived from the original on 26 May 2012. Retrieved 30 October 2011. ^ "Global statistics at w3counter.com". Archived from the original on 28 June 2012. Retrieved 23 January 2012. ^ "Troubleshooting MS-DOS Compatibility Mode on Hard Disks". Support.microsoft.com. Archived from the original on 10 August 2012. Retrieved 7 August 2012. ^ "Using NDIS 2 PCMCIA Network Card Drivers in Windows 95". Support.microsoft.com. Archived from the original on 17 February 2013. Retrieved 7 August 2012. ^ "INFO: Windows 95 Multimedia Wave Device Drivers Must be 16 bit". Support.microsoft.com. Archived from the original on 17 February 2013. Retrieved 7 August 2012. ^ Arthur, Charles. "Windows 8 will run on ARM chips - but third-party apps will need rewrite". The Guardian. Archived from the original on 12 October 2016. ^ "Operating System Share by Groups for Sites in All Locations January 2009". Archived from the original on 6 July 2009. ^ "Behind the IDC data: Windows still No. 1 in server operating systems". ZDNet. 26 February 2010. Archived from the original on 1 March 2010. ^ Stallings, William (2008). Computer Organization & Architecture. New Delhi: Prentice-Hall of India Private Limited. p. 267. ISBN 978-81-203-2962-1. ^ Poisson, Ken. "Chronology of Personal Computer Software" Archived 14 May 2008 at the Wayback Machine. Retrieved on 2008-05-07. Last checked on 2009-03-30. ^ "Reading: Operating System". Lumen. Retrieved 5 January 2019. ^ "My OS is less hobby than yours". Osnews. 21 December 2009. Archived from the original on 24 December 2009. Retrieved 21 December 2009. ^ "The History of Unix". BYTE. August 1983. p. 188. Retrieved 31 January 2015. Auslander, Marc A.; Larkin, David C.; Scherr, Allan L. (1981). "The evolution of the MVS Operating System" (PDF). IBM J. Research & Development. Bic, Lubomur F.; Shaw, Alan C. (2003). Operating Systems. Pearson: Prentice Hall. Silberschatz, Avi; Galvin, Peter; Gagne, Greg (2008). Operating Systems Concepts. John Wiley & Sons. ISBN 0-470-12872-0. O'Brien, J. A., & Marakas, G. M.(2011). Management Information Systems. 10e. McGraw-Hill Irwin. Leva, Alberto; Maggio, Martina; Papadopoulos, Alessandro Vittorio; Terraneo, Federico (2013). Control-based Operating System Design. IET. ISBN 978-1-84919-609-3. Arpaci-Dusseau, Remzi; Arpaci-Dusseau, Andrea (2015). Operating Systems: Three Easy Pieces. Look up operating system in Wiktionary, the free dictionary. Wikimedia Commons has media related to Screenshots of operating systems. This page was last edited on 27 March 2019, at 11:08 (UTC).